There are discrepancies in the owners manual regarding usage of the cold starting device/idle-speed knob. The cold starting aid / Idle speed knob equipped to the 1Y diesel engine is used to increase the idling speed from 900RPM (-/+ 30RPM) when pushed in to 1050RPM when pulled out (-/+ 50RPM). It is used to accelerate cold starting and to raise the idle speed if engine vibration is occurring. The second instruction of the owners manual is to push it in when the engine is at it's "normal operating temperature" - This is 80-90°C. The third instruction is to pull the knob out slightly to increase idling speed if there is noticeable engine vibration. This is mentioned as a side note irrespective of engine temperature and no explination is given as to why engine vibration may occur (one could speculate at faults with the engine or poor quality fuel). These three instructions are from the Golf Instruction Manual supplied to all Golf Mk3 vehicles. There is no mention of the cold starting aid in the Ecomatic Owners Manual supplement. It is clear that this is a generic referance and no clear instructions are given for model use. Due to the nature of the Ecomatic, this must be used slightly differently than it would on a standard diesel Golf. When the engine is cool (below approx. 60°C coolant temperature), the engine restarts noticeably quicker when the idle speed knob is pulled out, this is important as a faster restarting engine reduces the load/wear on the starter motor, electrical system, and increase acceleration responsiveness. On the other hand, the clutch operation is not as smooth when this knob is pulled out, and fuel consumption is also increased. 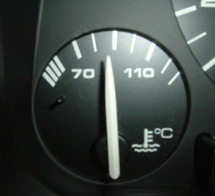 Engine running control lamp K111 goes out at approx 45°C (usually very slightly less than the temperature at which the glow plugs no longer operate), leaving a period of start-stop operation where the cold starting aid should remain pulled out else the engine may take a considerable time to restart in Ecomatic operation, especially if the vehicle is standing for longer than 15 seconds in traffic. In summary, the cold starting aid should not be pushed in until the difference between the time taken to restart the engine with the knob pushed in vs pushed out is small, which is at a coolant temperature of approximately 60C during winter, and slightly less during summer. Note that this is only an approximation because other factors (ambient temperature, engine temperature, time vehicle coasts/stands with engine off, fuel condition, engine condition, battery condition, starter motor condition, etc) influence the start-up duration. The coolant temperature figure is stated as a rough guide for ease of use purposes as it can be obtained by looking at the coolant temperature gauge on the vehicle. A final reminder, the gauge should point almost straight up at 90C once fully "warmed up" - the thermostat specification is 87°C. 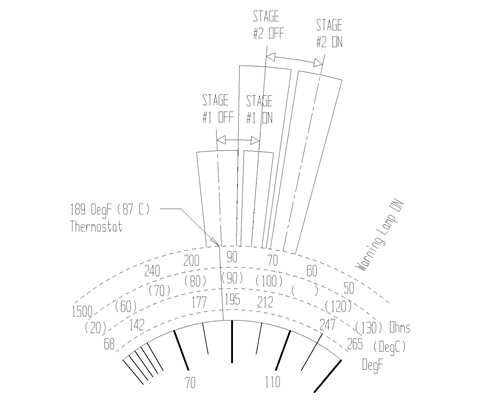 If the needle tends to settle below 80C when in motion, assuming the temperature reported is correct, you likely have a semi-failed thermostat which is stuck open.